Stuck for time during the week yet still want a delicious home-cooked meal? This quick and easy prawn and tagliatelle dish may be just what you need. With minimal prep and cooked from start to finish in less than 15 minutes, this simple combination of textures does not hold back on flavour! Let me know if you enjoy this recipe as much as I do. Cook tagliatelle as per instructions with salted boiling water. Personally, I find al dente works best. Opt for a lower calorie spaghetti if needed to support goals (i.e. ~180kcal per 100g). Finely chop the garlic and red chilli. Season and roughly chop the tomatoes. Heat the oil in a deep pan over a medium heat, add the garlic, chilli and tomatoes and cook for 1-2 minutes. Pour in the white wine and bring to the boil. Cook for 1-3 minutes until reduced and the alcohol has evaporated. Season to taste. Add the prawns and fry until cooked through (2-5 mins depending on size). Once cooked, add the spaghetti to the pan. Save some of the spaghetti water if needed to help combine the flavours. To garnish, finely chop the parsley and serve. 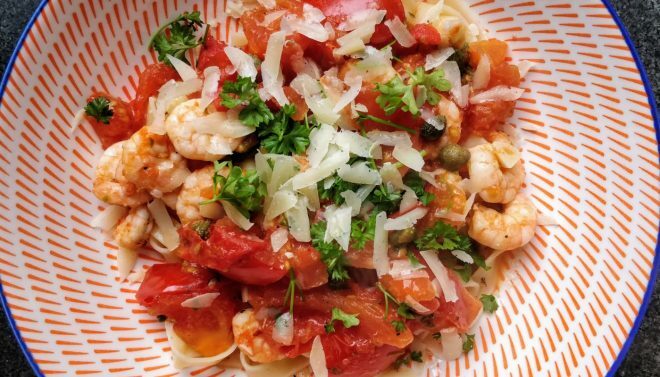 If you have enjoyed this quick and easy Chilli Prawn and Tomato Tagliatelle dish, please feel free to share on Facebook or tag our Instagram page with your recipe-inspired picture.